Instead of using old newspapers to protect your fragile Christmas decorations, use discarded wrapping paper – shred, stuff and wrap your trinkets and baubles and keep them safe until next year. To give an old bookshelf a new lease of life, try smoothing out any creased wrapping paper using a piece of cloth and low-set iron, and line the shelves with your favourite patterns. Drawers lined with leftover wrapping paper look colourful and the paper will also protect your clothes from dust and dirt. Try this in kitchen cupboards and in cutlery drawers too! Some wrapping paper designs are just too pretty to simply throw away. Buy a nice frame and cut out a square of your favourite design to add to a feature wall. 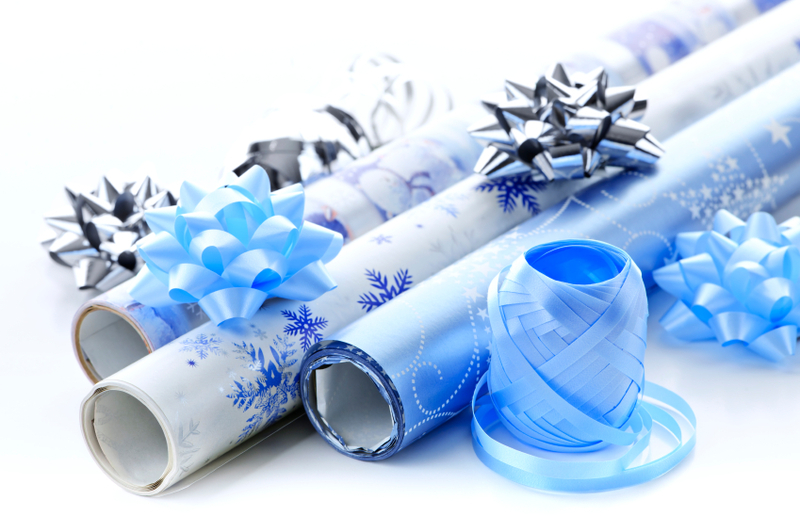 There are tons of different ways you can utilise used wrapping paper for arts and crafts. Why not try making party hats and bunting for children’s parties? Or cover half a balloon in strips of paper and PVA glue, leave to set and then pop the balloon to create a small bowl for bits and bobs. If you’ve got any spare kitchen roll tubes, get really crafty and make some pencil pots to keep your work desk tidy and organised. I do this, especially for children’s presents. I was brought up in the age of ‘waste not want not’. make a bunch of paper flowers with the wrapping paper to make a wonderful display or add a few to a birthday parcel.